The Best Day Drinking Snacks | Good. Food. Stories. What are the best snacks for day drinking? Full disclosure: this question was submitted to me by a friend who is a responsible, functioning adult and mother, so it’s not like we’re talking about wild weekend house parties here. 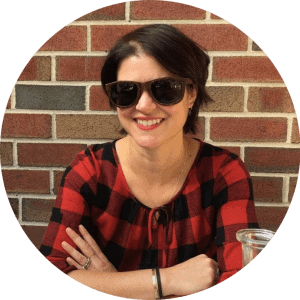 I know what she’s going for—sometimes there are those weekends when brunch goes a little long, or when play dates happen to be accompanied by a bottle of rosé, or, hey, when you just feel like playing hooky for the day. There are snacks you make while you’re drunk, like sloppy nachos, messy mac and cheese, and whatever reheated leftovers you can get your hands on (though I’m always a fan of the cold pizza dipped in ranch dressing, no shade). But we’re adults here, so if we’re going to be day drinking, we can plan ahead and have an arsenal of snacks on hand so we’re not getting our buzz on with empty stomachs, nor are we tempted to raid the freezer for the kids’ dinosaur-shaped chicken nuggets. When stocking up for day drinking, a good rule of thumb to keep in mind is to turn to dishes and snacks you’d want to be eating at a picnic or a cookout: they’re portable, they’re often finger foods so you won’t have to bother finding a fork or a spoon, and they’re make-ahead recipes. Even if you’re not taking your boozing outdoors, these are the versatile qualities you’ll appreciate when you’re on your third glass of wine before 2:00 pm. These might sound like very specific requirements, but there’s a bunch of stuff that fits within this Venn diagram I’ve laid out for you here. 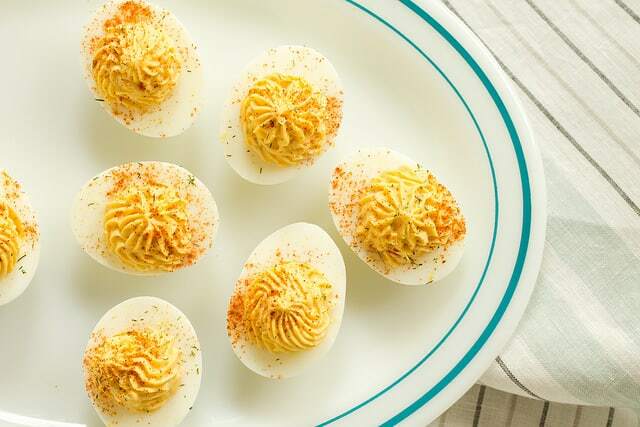 For starters, I am helplessly weak when faced with a platter of deviled eggs. I rarely need an excuse to make them, but day drinking is as good an opportunity as any. Hell, these things were pretty much invented to add a touch of class to the act of boozing on a sunny day. And Olivia Pope is right to trust her gut about the combination of popcorn and wine. All that fiber in those little puffy kernels make it as perfect a combination for afternoon drinking as it is for a night on the couch. For more sustenance, you can’t go wrong with a side of grilled cheese. Make them in advance—whether as individual sandwiches or a big skillet-sized grilled cheese sandwich to share—and then wrap in foil. Reheat the packets in a toaster oven when you’re ready to chow down. 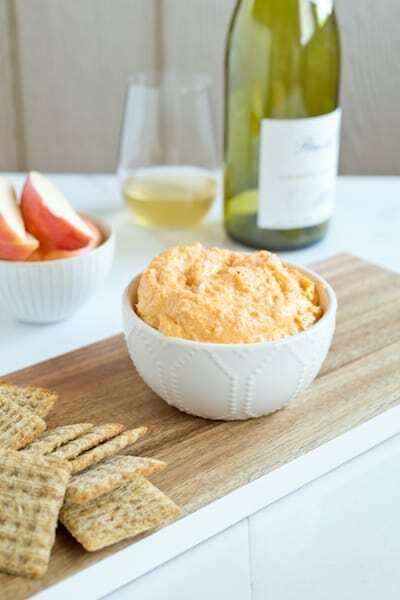 But if you are truly wedded to having something to dip and spread while you drink, here’s a solution: a butternut squash and goat cheese spread that’s a surprisingly snackable marriage. The cheese keeps it savory, creamy, and decadent; the squash keeps it filling and kinda healthy while adding a sweetly caramelized note. Add a little maple syrup and a pinch of salt to keep the sweet-salty thing going, and pair it with equally sweet and salty dipping elements. 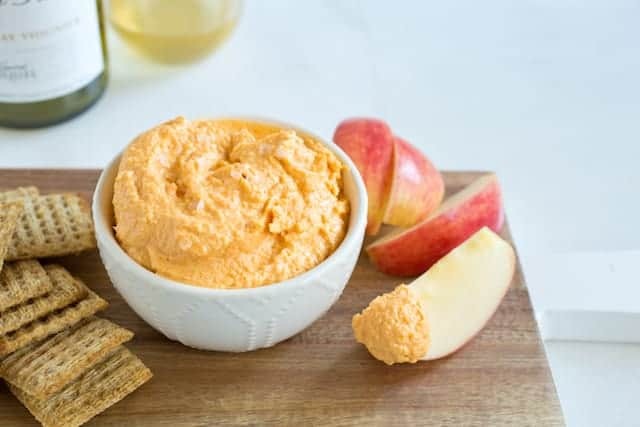 Triscuits, apples, celery, and toasty baguette slices all match up with this dippable spread. Now go get your day drink on! Add the cubes of butternut squash to a food processor and pulse to a chunky puree. Scrape the bowl down and add the goat cheese, maple syrup, and salt. Continue to process, scraping the bowl down again as needed, until you get a smooth, thick dip. Taste and add a pinch more salt if you like. Serve with your favorite dipping and spreading elements like those noted above.